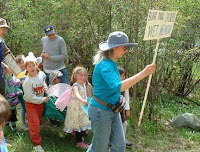 Kids and other friends of the Wet Meadows turned out in large numbers at last Sunday's Earth Day Celebration. They dressed up for the All-Species parade. Also, Super Swampers demonstrated the storm water model (made from three paint trays) and talked to many kids and parents. Sharing our info and enthusiasm has a long tradition.